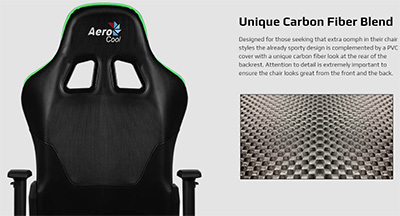 Inspired by racing cars, the AC220 RGB is designed to transform your gaming room into one sleek place to be. 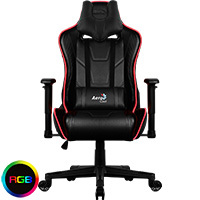 The AC220 RGB is equipped with RGB lighting that can be set to 4 colour modes. 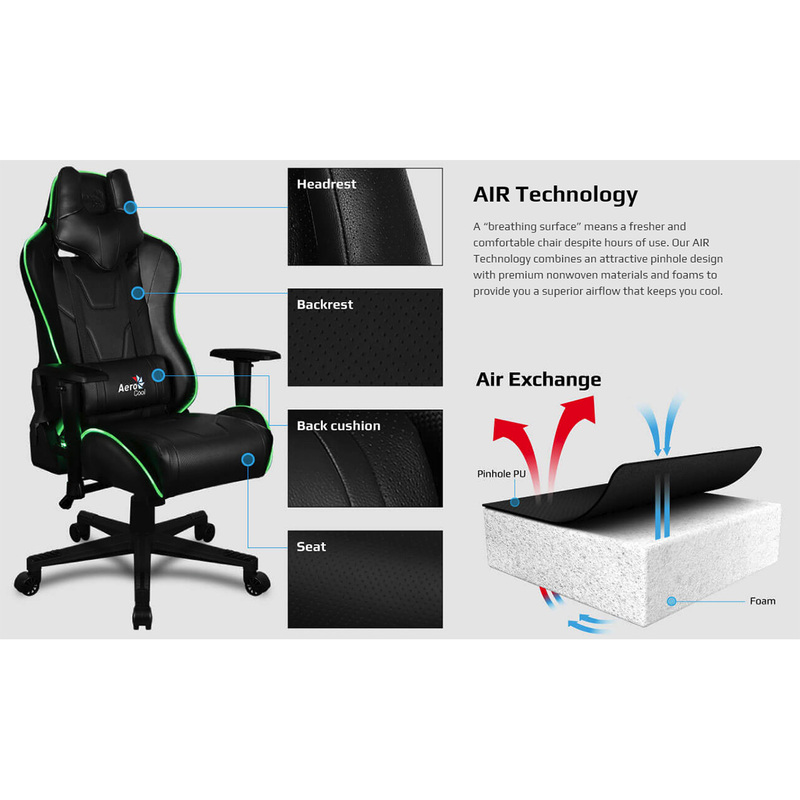 The pinholes in the sitting surface and the backrest of the AC220 RGB allow the internal materials to breathe, keeping the chair comfortably cool even after long gaming sessions. * Power bank and remote control batteries are not included. 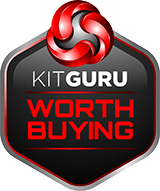 - AC220 RGB features edge roll lighting, Aerocool�s patented optic strip lighting. 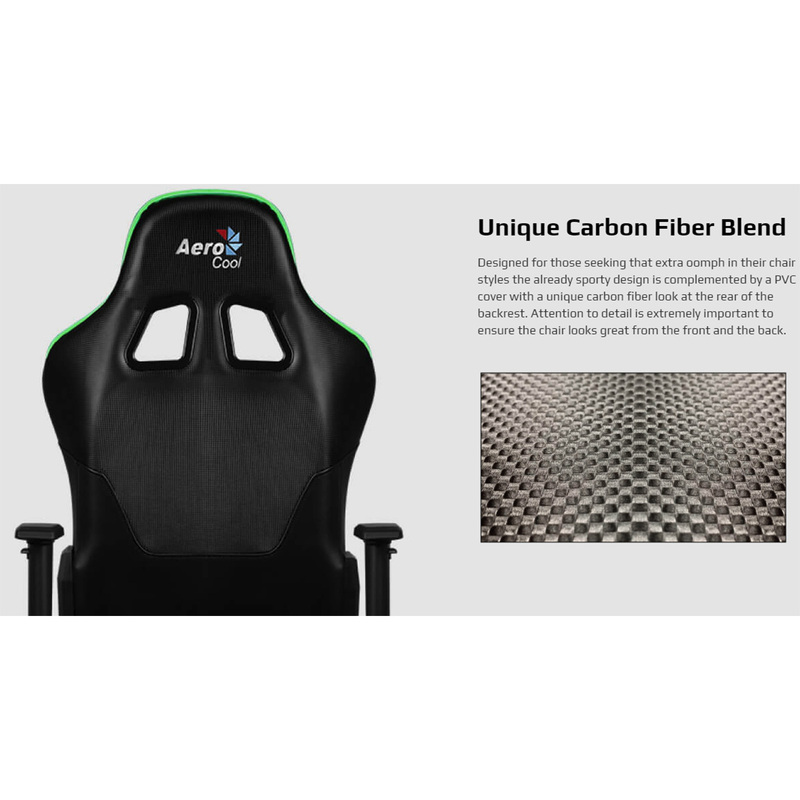 * We carefully selected the fibre optic strip best suited to provide the most attractive lighting and seamlessly incorporated this strip in the outer rim of the chair. 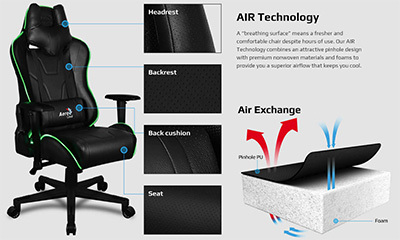 * Design patented in the European Union, China and Taiwan. 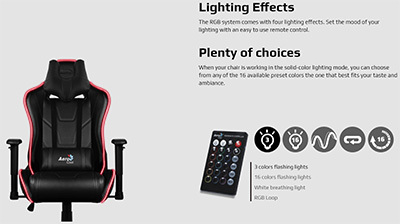 Lighting Effects - The RGB system comes with four lighting effects. Set the mood of your lighting with an easy to use remote control. 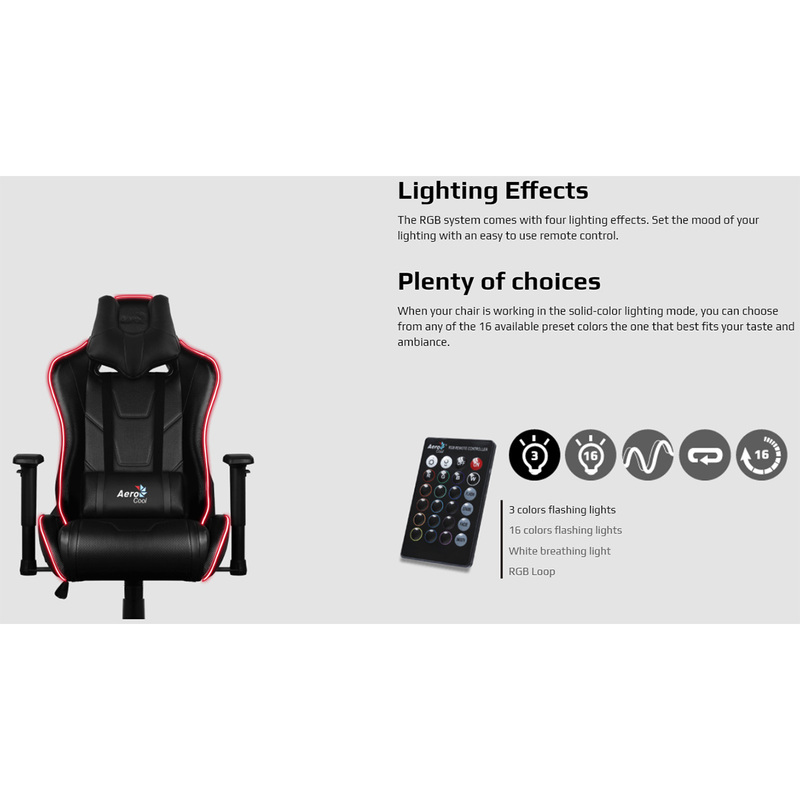 Plenty of choices - When your chair is working in the solid-colour lighting mode, you can choose from any of the 16 available preset colours the one that best fits your taste and ambience. 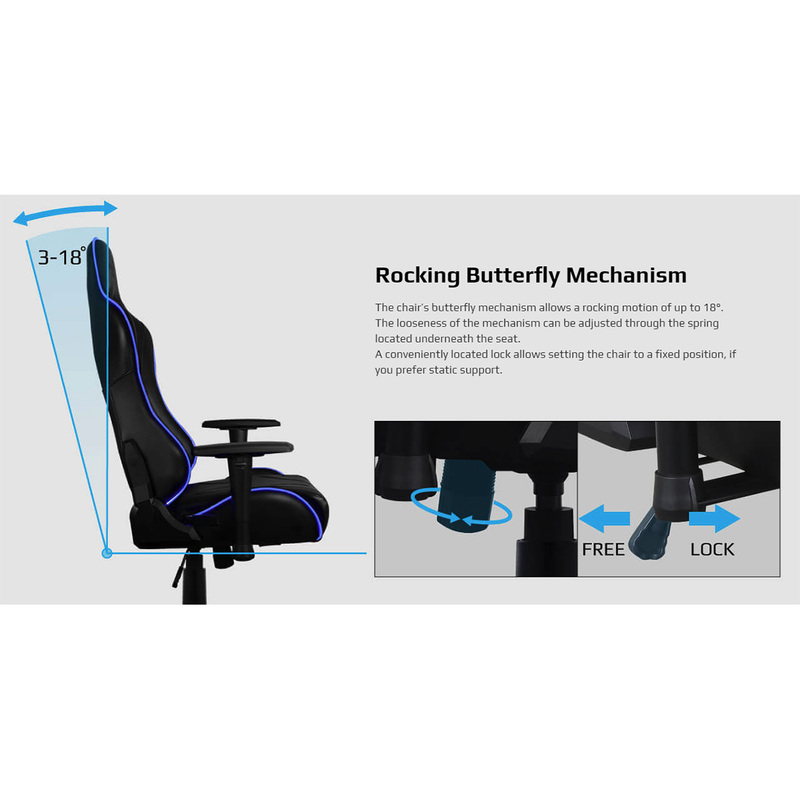 Light It Up - All RGB functions are powered by a USB power-bank. 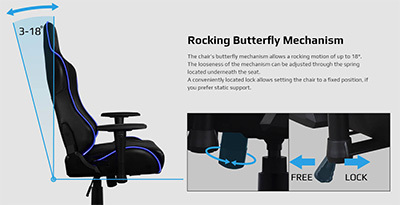 You can conveniently place your power-bank in the pocket below the chair. * *Power bank and remote control batteries are not included. 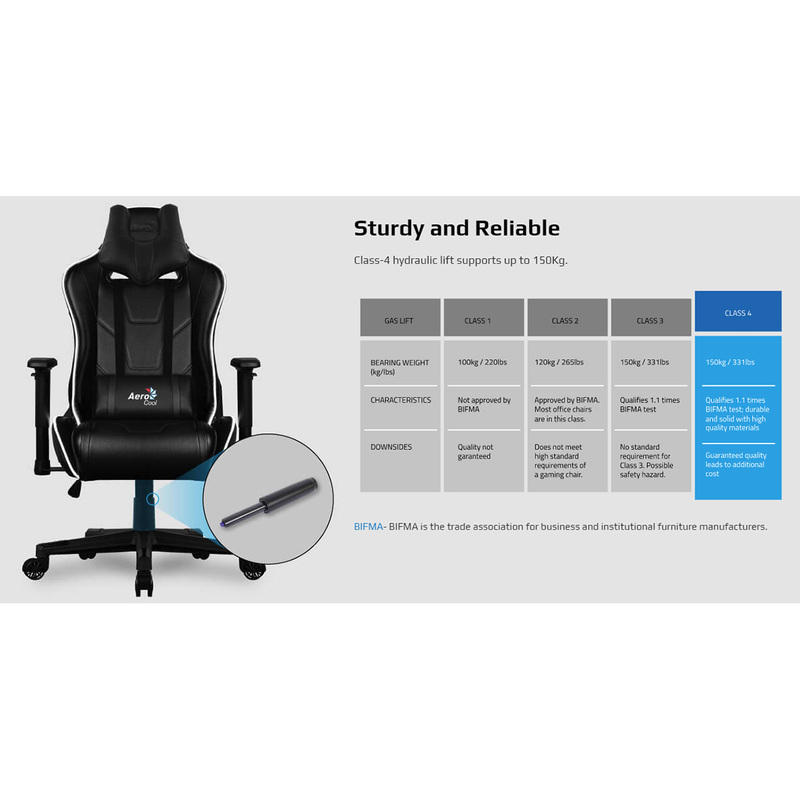 Best Ergonomics - Paired with the best ergonomics and impressive design - Aerocool� gaming chairs don't just qualify as a comfy office chair, but bring all the requirements to the table as a proper gamer�s chair. 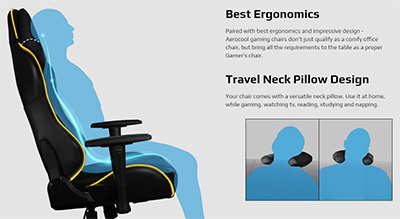 Travel Neck Pillow Design - Your chair comes with a versatile neck pillow. 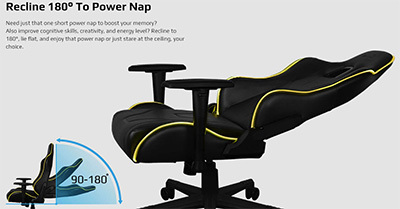 Use it at home, while gaming, watching TV, reading, studying and napping. 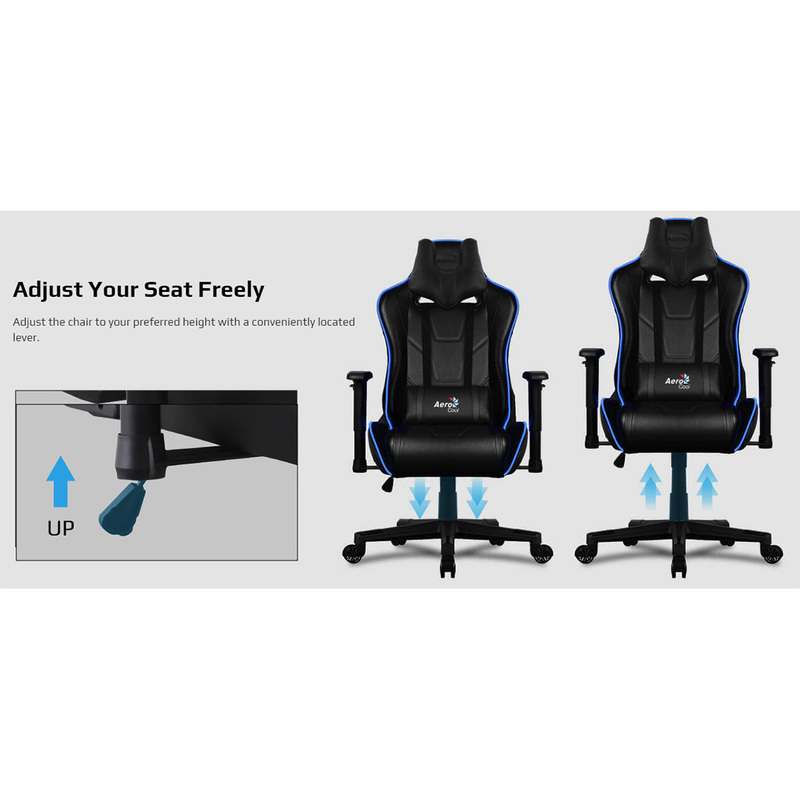 Adjust Your Seat Freely - Adjust the chair to your preferred height with a conveniently located lever. 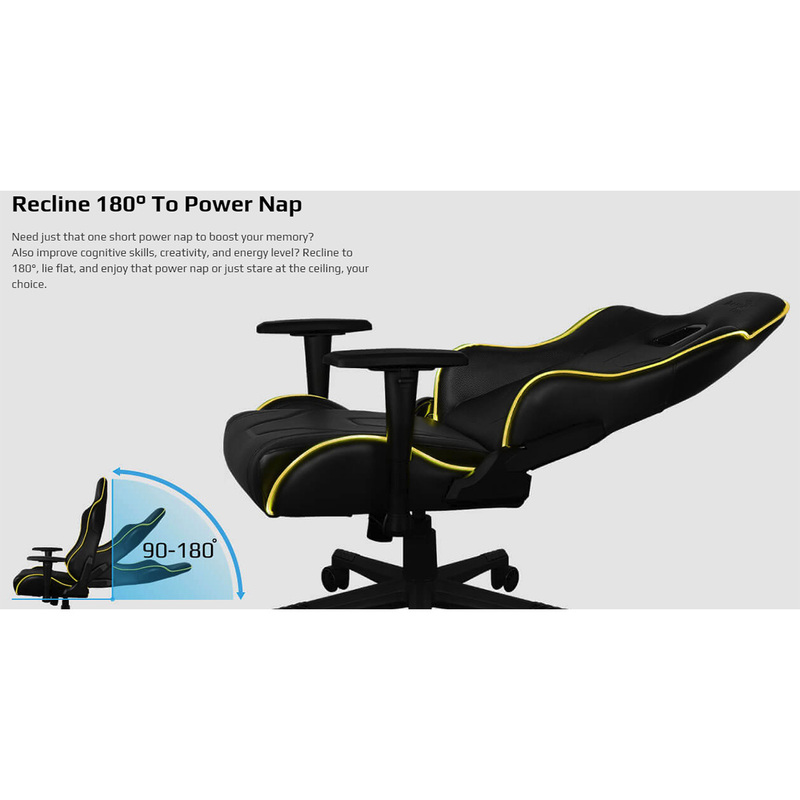 Recline 180� To Power Nap - Need just that one short power nap to boost your memory? Also improve cognitive skills, creativity and energy level? 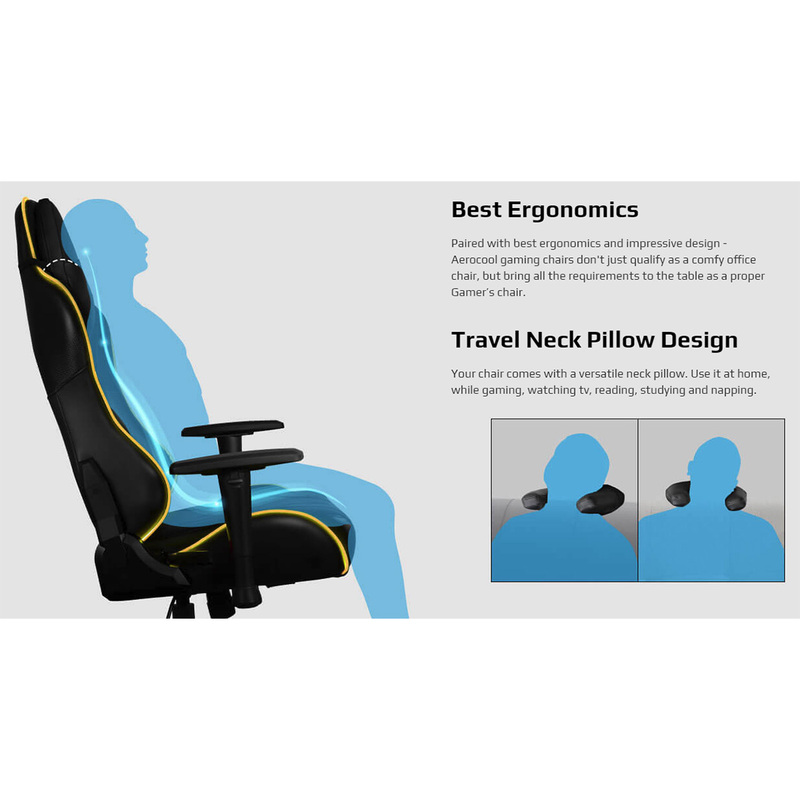 Recline to 180�, lie flat and enjoy that power nap or just stare at the ceiling, your choice. 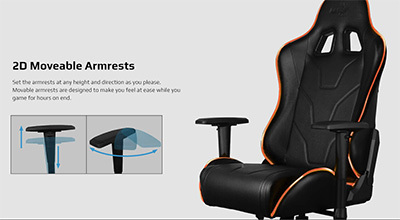 2D Moveable Armrests - Set the armrests at any height and direction as you please. 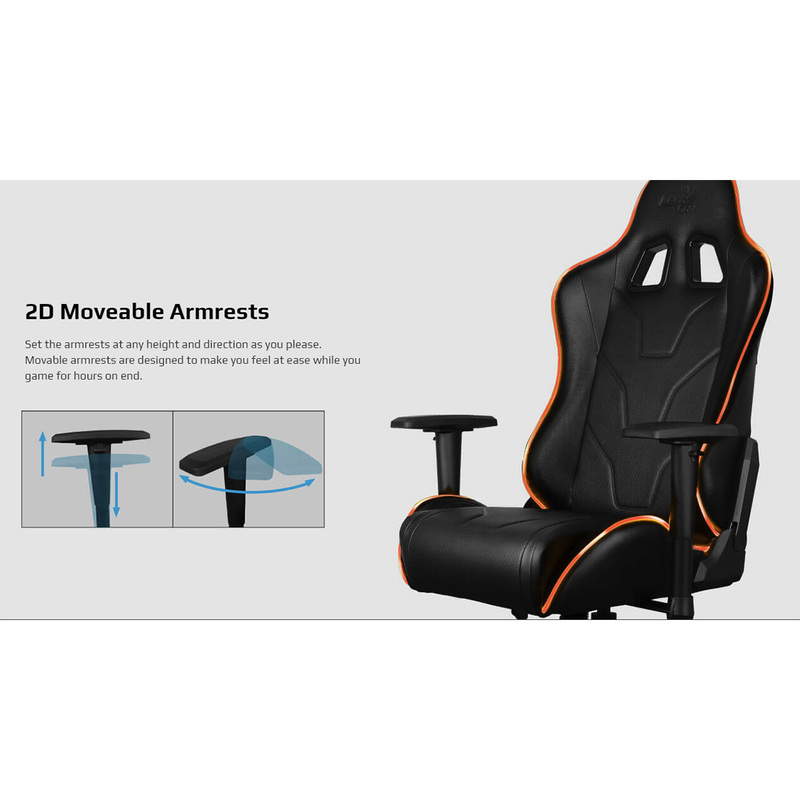 Movable armrests are designed to make you feel at ease while you game for hours on end. 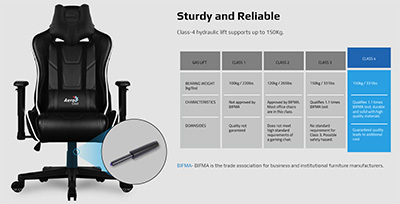 Sturdy and Reliable - Class-4 hydraulic lift supports up to 150Kg.